More than half a million birds have died thanks to a highly pathogenic H5 avian influenza strain that has torn through Baghdad and in Iraq. Over 2.8 million are reported to be at risk of catching the deadly virus that has so far been reported in 11 precincts across Iraq's capital Baghdad and the easterly city of Wasit - a UNESCO World Heritage site. A source of the outbreak remains "unknown or inconclusive", according to the World Organisation for Animal Health (OIE). 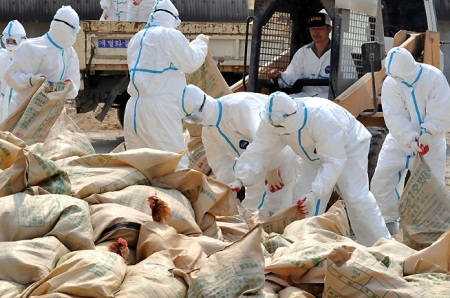 In total, 512,948 chickens died as a result of the H5 avian influenza virus, whilst a further 2.3m have been euthanized in order to quell the virus from spreading to other parts of Iraq and evolving into an epidemic. The virus was first detected on 15 June 2016 and it took six weeks for Iraq to send a detailed report of the bird flu strain to the OIE. Dr Salah Fadhil Abbas, director general, Veterinary Directorate, Ministry of Agriculture in Iraq reported the disease to the OIE. This is the second large bird flu outbreak reported in Iraq in the year after the H5N1 strain killed 77,101 birds in April. A report from the US Department of Agriculture from April reported it expected the US to enjoy a rise in broiler meat exports to Iraq thanks to the relaxation of avian influenza-related safety restrictions.